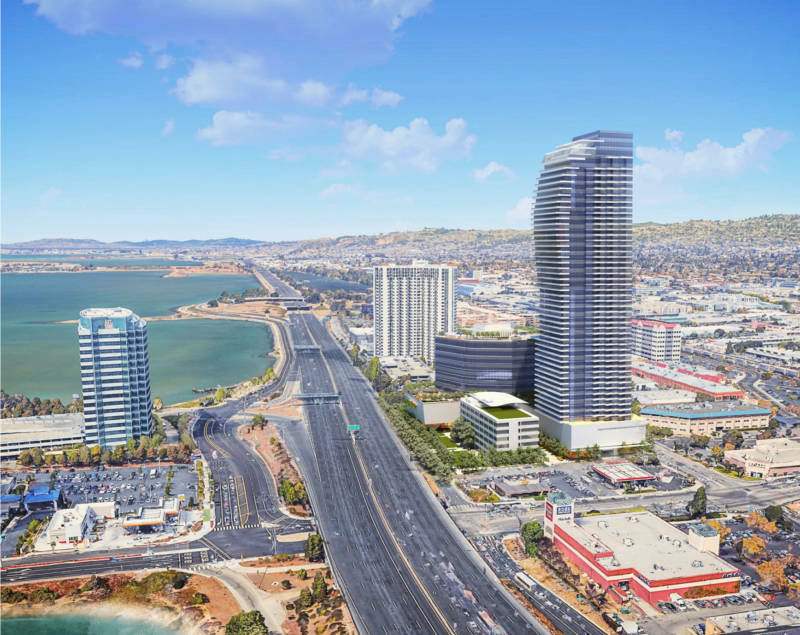 Emeryville officials are set to host the first in a series of public meetings to consider a proposed 54-story residential tower near the city's shoreline. The structure would be the East Bay's tallest building. Slated for a nearly 4-acre lot near one of the city's busiest intersections at the corner of Christie Avenue and Powell Street, the development would include 638 apartments and tower almost 700 feet above the bay. The project would also include an adjacent 16-story office building, retail space and a half-acre public park, as well as six floors of parking. The development would replace an existing one-story building that currently houses the Emery Bay Cafe and Allegro Ballroom. To be allowed to build such a high structure, Onni Group — the Vancouver-based developer behind the project — would be required to offer at least 108 of the apartments (roughly 17 percent) at affordable, below-market rates. If approved, the tower would be one of the tallest residential-only buildings west of Chicago, dwarfing Emeryville's current highest structure, the nearby 30-story Pacific Park Plaza. On Thursday, the developer presents its proposal to the city's planning commission, which will also hear the first round of public comments on the project. The session is the first step in a long succession of public meetings, environmental studies and permits in a process that will take well over a year before any final decision is made, said Emeryville senior planner Miroo Desai. "This is how it starts," said Desai. "We're looking at a year and a half, give or take, before anything happens." Desai said the developer came to the city several months ago with the idea for the project, and she has been encouraged by the lack of public opposition so far. “You'll be surprised that I’ve gotten inquiries, phone calls for clarification, and that’s it," she said. "I have not, at least yet, received any negative comments." But, she added: "That does not mean anything at this point." Increased traffic congestion is likely to be one of the chief concerns brought by Emeryville residents. "There’s a point at which the health and well-being of residents and existing businesses need to be a top priority over allowing this type of development to even be considered," wrote Boku Kodama in the comments section of the E'ville Eye, a hyperlocal news site. "The traffic and pollution are already bad enough in Emeryville." Thursday evening's meeting is scheduled for 6:30 p.m. at Emeryville City Hall.